Back in July, Drew Estate issued a flurry of pre-IPCPR Trade Show announcements, the foremost being the introduction of the new Undercrown Sun Grown line. Sun Grown makes three in the Undercrown portfolio, joining the Ecuadorian Connecticut-wrapped Undercrown Shade (released in 2015) and the original San Andrés-wrapped Undercrown line (released in 2010), which is now sometimes referred to as Undercrown Maduro. Sun Grown comes in six traditional sizes—Corona (5.6 x 46), Robusto (5 x 54), Gran Toro (6 x 52), Belicoso (6 x 52), Gordito (6 x 60), and Corona Doble (7 x 54)—plus Drew Estate’s familiar, sought-after Flying Pig vitola. Suggested retail prices range from $8.20 to $12.72. I smoked three Coronas for this review. This cigar has a smooth, velvety, milk chocolate-colored wrapper with moderate oils and only the thinnest veins. The well-executed cap and tight seams exude quality and careful attention to detail. The cold draw is nearly effortless, and the gentle pre-light notes at the foot remind me of sweet hay, earth, and green raisin. After establishing an even light, the introductory profile is a medium-bodied combination of roasted nuts, salt, dried fruit, creamy butter, tangy mesquite, and warm tobacco spice. The resting smoke is aromatic and sweet with roasted nuts as the primary note. After the first inch, a slightly sour, papery, somewhat stale taste creeps in that tends to overshadow the other flavors. The spice is now a bit subdued and reminiscent of a combination of white pepper and cinnamon. This is how the Corona remains until the final third, which sees an acceleration of spice. 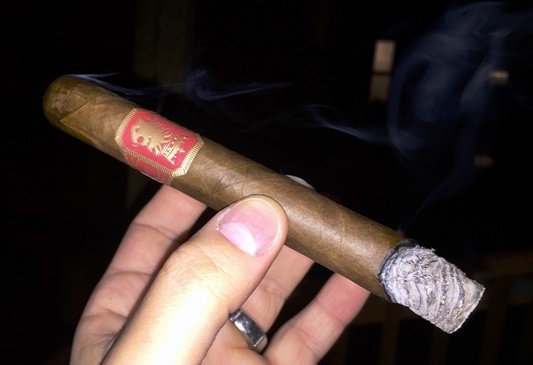 As for the combustion properties, I’ve come to expect near perfection from La Gran Fabrica Drew Estate. The Corona doesn’t necessarily disappoint in this department—the draw is smooth and the smoke production is good—but the ash is temperamental and the burn, while self-correcting, tends to be slightly uneven. When you add it all up, the Undercrown Sun Grown is by no means a bad cigar. There are plenty of interesting flavors, and smoking slowly tends to keep the stale note in the background.That said, it does not live up to the Undercrown pedigree; Undercrown Maduro and Undercrown Shade are both superior blends with more complex tastes. I am interested to see how some of the other Sun Grown vitolas perform. To be fair, the Corona is the only size I’ve tried to date. For now, though, in my book, I rate it three stogies out of five. I agree with the flavors listed, I’ve only smoked the robusto size and I would have given it a 4.5/5. The best Undercrown to date IMO. I rank them sungrown, shade, then maduro. I like the original Undercrowns a great deal. Good value. Just bought some of the shade line. I haven’t seen these yet.